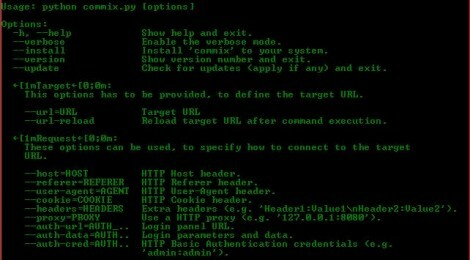 Browse: Home / Commix : Automatic All-in-One OS Command Injection and Exploitation Tool. Commix : Automatic All-in-One OS Command Injection and Exploitation Tool. Commix (short for [com]mand [i]njection e[x]ploiter) has a simple environment and it can be used, from web developers, penetration testers or even security researchers to test web applications with the view to find bugs, errors or vulnerabilities related to command injection attacks. By using this tool, it is very easy to find and exploit a command injection vulnerability in a certain vulnerable parameter or string. Commix is written in Python programming language. The tool is only for testing and academic purposes and can only be used where strict consent has been given. Do not use it for illegal purposes!! -h, --help Show help and exit. --verbose Enable the verbose mode. --install Install 'commix' to your system. --version Show version number and exit. --update Check for updates (apply if any) and exit. -h, --help Show help and exit. --verbose Enable the verbose mode. --install Install 'commix' to your system. --version Show version number and exit. --update Check for updates (apply if any) and exit. This options has to be provided, to define the target URL. --url=URL Target URL. --url-reload Reload target URL after command execution. This options has to be provided, to define the target URL. --url-reload Reload target URL after command execution. These options can be used, to specify how to connect to the target URL. --method=METHOD HTTP method (GET or POST). --host=HOST HTTP Host header. --referer=REFERER HTTP Referer header. --user-agent=AGENT HTTP User-Agent header. --cookie=COOKIE HTTP Cookie header. --headers=HEADERS Extra headers (e.g. 'Header1:Value1\nHeader2:Value2'). --proxy=PROXY Use a HTTP proxy (e.g. '127.0.0.1:8080'). --auth-url=AUTH_.. Login panel URL. --auth-data=AUTH.. Login parameters and data. --auth-cred=AUTH.. HTTP Basic Authentication credentials (e.g. 'admin:admin'). --method=METHOD HTTP method (GET or POST). --headers=HEADERS Extra headers (e.g. 'Header1:Value1\nHeader2:Value2'). --proxy=PROXY Use a HTTP proxy (e.g. '127.0.0.1:8080'). --auth-data=AUTH.. Login parameters and data. --auth-cred=AUTH.. HTTP Basic Authentication credentials (e.g. These options can be used, to specify which parameters to inject and to provide custom injection payloads. --param=PARAMETER Parameter(s) to inject (use 'INJECT_HERE' tag). --suffix=SUFFIX Injection payload suffix string. --prefix=PREFIX Injection payload prefix string. --technique=TECH Specify a certain injection technique : 'classic', 'eval-based', 'time-based' or 'boolean-based'. --maxlen=MAXLEN The length of the output on time-based technique (Default: 10000 chars). --delay=DELAY Set Time-delay for time-based and boolean-based techniques (Default: 1 sec). --base64 Use Base64 (enc)/(de)code trick to prevent false- positive results. to provide custom injection payloads. --param=PARAMETER Parameter(s) to inject (use 'INJECT_HERE' tag). --suffix=SUFFIX Injection payload suffix string. --prefix=PREFIX Injection payload prefix string.